Today's So Shoe Me is the Zidane Bootie by Kelsi Dagger, $165, available at Wasteland. This tapestry treat in warm autumnal hues will add the perfect tribal twist to your shoe collection this fall. 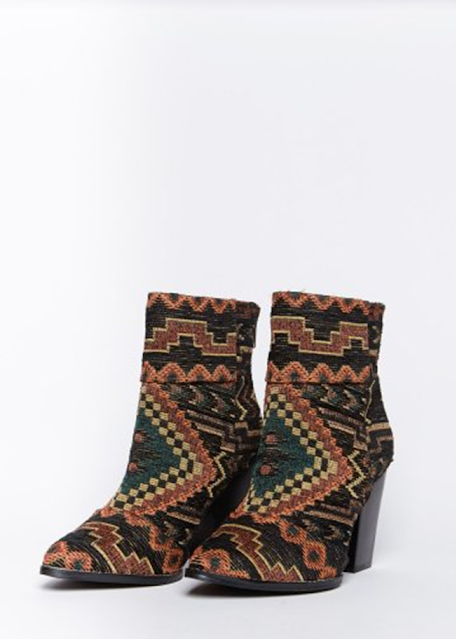 A rich geometric pattern in a thick and durable textile adds a southwestern twist in a classic bootie shape. The warm rusty hues add a rich feel to these everyday booties and the block heel add a flattering lift while keeping all day comfort. Pair these boho booties with a safety pin covered tee and slouchy pants for a mix of indie and grunge this fall. So Shoe Me a pair of southwestern tapestry booties that will add a punchy pattern to my everyday fall staples.